Last Sunday’s breakfast was a simple, slap-bang up job of six eggs scrambled in a wok over a moderately low flame, to which I had stirred in a heap of flaked smoked salmon that my sister-in-law had given me some months ago. Heaped onto a crunchy piece of toast, it ironically reminded me of the countless blurry-eyed breakfasts I had during my university days in the northern English town of Hull. 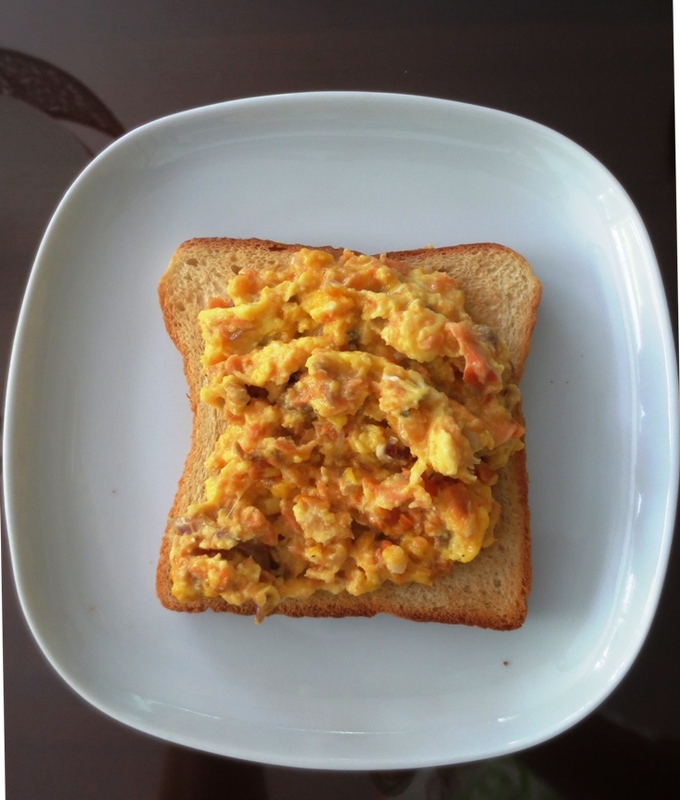 Not that smoked salmon ever found its way into Thwaite Hall – the charming red brick student hall I was living in then – but the messy heap of eggs against the brown toast certainly looked familiar. But this toast on my dining table was an upmarket version of the Toasts of Thwaite, enhanced even more so with a breakfast champagne to wash it down – a bottle of inexpensive but enjoyable Jaillance Muscat, a sparkler from France, nicely chilled to welcome a warm tropical morning. The cooks in the Thwaite Hall kitchen were fond of topping the toasts with three things – pasta rings in watered down tomato sauce that came no doubt from cans; warm baked beans which kept you embarrassingly gassy all day, and scrambled powdered eggs which the cooks cut out in solid cakes with their industrial sized ladles and plopped unceremoniously on your waiting bread. Accompanied by weak tea, it was a rather miserable breakfast to digest before you trotted out into wintry weather to walk 25 minutes to campus. Then again, not every toast I met in Hull was disconcerting. Occasionally, my friend Kate and I would meander over to the village of Cottingham. We liked this quaint little tea room located upstairs from a grocer – I cannot remember their names sadly but I can still pin point where they were. There, we’d have a pot of tea – so very English – and rather creative toasts….or at least, I thought they were. These were wholemeal topped with mashed bananas and crushed walnuts, toasted, crunchy, creamy and warm, or mushrooms fried in lots of butter and poppd on toast, if I preferred it savoury. For a student back in the late ‘80s, this was really quite a treat. These days, if I were to lux up the toasts of Thwaite Hall, I would have my scrambled eggs on toast made with fresh eggs with smoked salmon and a dollop of caviar. Instead of canned pasta rings, I’d have my pasta cooked in white wine reduction with garlic, some leeks, smashed cherry tomatoes and finished off with truffle-infused olive oil. And finally, baked beans are easy – refried with chopped bacon and a sprinkling of rosemary; then a layer of gratinated cheese on top. And to wash it all down? A few flutes of champagne, of course.